Queen Jiso (Kim Ji Soo) has ruled the Kingdom of Silla as regent since King Beopheung passed away, keeping her young son Sammaekjong(Park Hyung Sik) hidden outside of the capital Seorabeol and safe from enemies and assassins. As Sammaekjong comes of age, nobles, citizens, officials and Sammaekjong himself have all grown impatient for the queen to cede power. However the powerful nobles that tried to usurp power in the Kingdom continue to eye the throne and Queen Jiso fears the consequences of her ceding it. In order to break the power of the nobles, who have grown accustomed to their privileges under the bone rank system, Queen Jiso plans to create a new elite, the Hwarang, that will cut across the existing power factions, and to bind them to Sammaekjong and the throne. As this new elite of male youths bond and grow they are unaware that within their number is their future king, Sammaekjong, and Kim Sun Woo (Park Seo Joon), a commoner with a secret even he is not aware of. A really surprisingly good drama. I got hooked really fast and couldn’t let go. I can’t deny all the pretty actors didn’t have an effect but oh well. They knew how to get their fans hooked. The storyline progressed fast, however you figured out the ending pretty quickly. Which was a little turnoff, but nevertheless you continue for the sole purpose of just watching the pretty actors. Go Ah Ra is a good actress, but she’s not on a wow-level I think, or maybe this performance wasn’t her best. 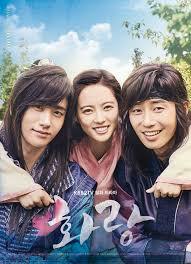 What I like the most is that Park Soo Joon managed to get over the fact that this is about pretty soldiers, after all it is called Hwarang; the flower knights. It was like he didn’t use that as his main goal, but more found depth in his character. Which is why I’ve started to like Park Seo Joon more as an actor, he managed to stand out without using his good looks to his advantage but rather excellence acting. I’m looking forward to more projects from him. All in all a good drama, that I do recommend to all period drama fans.